Pompeii was a town destroyed by a volcano called Vesuvius. The very word volcano comes from the Roman god of fire Vulcan. Pompeii is a very interesting town from a language point of view because when it was uncovered, graffiti was found talking about the contemporary society and was a great insight into what life was like in that town at the time. When you grow up with a writing system you think it has always been like that. And the Latin script has been the same for a very long time, but there have been some additions over the centuries. One that is very noticable if you read old Latin texts is the lack of the letter J.
I was used for both the “i” sound and the “j” sound. Over time people started putting a little down stroke on the i to show that the consonant version of i was meant, and it eventually became its own letter. Find the story about the other additions to the Latin script in the video on this post. Verbs of motion are words used to describe how something moves. In English we use prepositions for this, e.g. I go by car, by foot, by plane. But in other languages, such as Russian, they use special verbs, called verbs of motion, to explain how the movement happens. 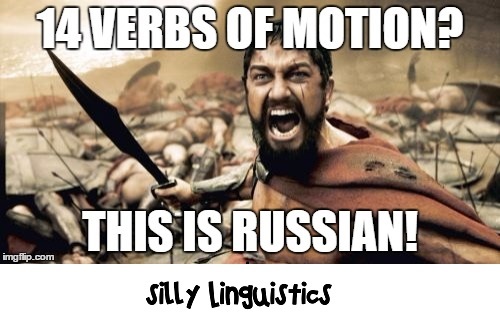 Russian has 14 verbs of motion! This can take quite a while to learn, but it is really awesome that there is this kind of variation in world languages. Wow! I never thought of all the work that goes into creating these fonts! For Chinese, they need to make a design for every single character and there are very few shortcuts they can use. This is why there are so few Chinese fonts compared to the thousands and thousands of Latin fonts. Everyone likes to swear! Don’t even f*cking try to tell me you don’t 😀 Swear words are very interesting little words that often come from very specific places in life, no matter the language or culture. Most swear words originate as words relating to animals, bodily excretions or family members. I love these! It’s so funny how we think words are these neat packets of meaning, when in fact, they are just sounds that we are used to interpreting in a certain way. “Whale oil beef hooked” when said fast sounds almost identical to “Well, I’ll be f*cked” in an Irish accent 😀 There are plenty more examples in the video on this post. Counting stuff in Japanese is weird. To make sure you are following the rules of Japanese properly, you need to use the “counter word” appropriate for the thing you are counting. Long thin things get a counter word and flat things get their own counter word. Even some japanese natives get them wrong! For a quick overview of counter words in Japanese, check out the video in this post. Ich speak immer like this mit meinem Freuden. Es is very fun in viel Sprachen zu reden. Es macht my head ein bisschen kaputt, men jag tro det är bra och kul. Wie viel languages can du sprechen? I always speak like this with my friends. It is very fun to speak in many languages. It breaks my brain a bit, but I think it is great and fun. How many languages can you speak?